FTC disclaimer: Most of my blog posts do contain affiliate links. This is this blog's most popular post, and I've revised it slightly since it originally published in July 2010. I love to enter sweepstakes, contests, and giveaways. I think it's no secret I get slightly annoyed when I mention something I've won and I get the comment, "You're so lucky" or "I've never met anyone as lucky as you." While luck has a bit to do with it, I see sweepstakes as just a numbers game. Contests rely on skill and therefore there is no luck involved. I do spend a lot of time entering sweepstakes and giveaways. Probably as much as a part-time job would take. Would you ever go up to anyone who gets a paycheck from a part time job and say "Wow! You got a paycheck. You are so lucky". Okay, maybe in this economy you would, but I think you can see my point. :) Also, I will go out of my way to enter ones that require more effort to win. One day last summer I had just gotten home from grocery shopping and about 15 minutes later I got an e-mail letting me know about a new contest that was out. It required a certain product in the photo. I got back in my car and made another 20 minute trip to town to get the required item. I don't think many people would do that, but I was rewarded nicely with a $275 gift card when I was chosen as one of the winners. It used to be said there were three Ps in sweepstakes: Patience, Persistence, and Postage. While there are still snail mail sweepstakes, I think for me, the acronym has changed to PEP -- Patience, Effort, and Persistence. Going the extra mile can result in a win, especially with all the new sweepstakes on places like Instagram and Facebook which ask for a photo. I highly recommend an e-mail address different from your personal one. I personally like gmail, but any e-mail is fine. I would recommend, however, that you use a web based e-mail instead of one through your ISP. When I wanted to change ISPs, I didn't want to lose any wins, so had to keep my old ISP for a while to make sure that I didn't miss any notifications. I also recommend a generic username instead of something with "win" in it. That can send the wrong message to sponsors even if we truly are consumers. The next thing is always be sure and follow the rules. If it says one entry, don't try for multiple entries. There's more sweepstakes out there than any one person could ever enter, so if it's a one entry, just enter and move on to the next. Other things to watch for is eligibility. Some might only be open to certain ages, certain states, etc. I remember that there was one a couple years ago only open to guinea pigs. I entered -- or rather I entered my guinea pig -- and he won. The odds were good on that one because of the limited entrant pool. Be ethical. Don't enter your dog just because he has a name that sounds like a person. Or if you're in a voting contest, don't devise ways to cheat the system and get more votes than you are allowed per person. Buying votes can get you disqualified. Also, make sure whatever you are entering in a skill contest is your own creation. 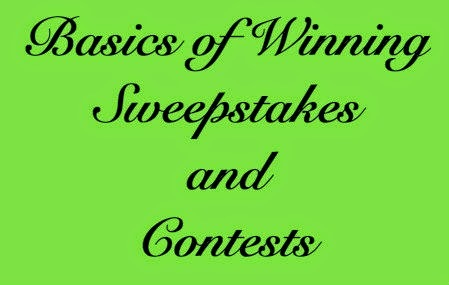 To do online sweepstakes, you need a computer. I highly recommend the site Online-Sweepstakes.com because they list so many sweepstakes, (as of tonight there are almost 8,000 different giveaways listed on this site.) I do recommend upgrading to premium if you enjoy it because the most "winnable" sweepstakes are only able to be seen by paying members. I also recommend the program Last Pass. I used to use Roboform, but when I got a Mac, I found LastPass worked better for me. Also, if your computer has autofill you may not even want to download either of these programs. It makes filling forms so much easier. Really a computer, and Online Sweepstakes is all you need to get started to enter online. To enter snail mail sweepstakes you need a few more things. Envelopes. Stamps. Index cards. 3x5 papers. And I highly recommend a subscription to Sweeping America Sweeping America This is a weekly sweepstakes newsletter and because it's weekly, new sweepstakes can be published very quickly. In the event of daily prizes, this can be the difference between winning and losing! So, I highly recommend it! (If you subscribe, please say Jenn Wilson in WV referred you.) The reason I prefer this newsletter is it comes out weekly and if any great sweepstakes are found between issues, they will send an e-mail alert to give you the heads up. Remember my $275 gift card? That's how I learned about that one. Another site I use is Sweeties Secret Sweeps (please say jenndiggy referred you). This is a unique site for me. I check in once a week or so. Her speciality is locals, and I wouldn't recommend this one until you have been entering for a while because the organization of OnlineSwepstakes is fantastic. I also love IWinContests newsletter. (Please say Jenn Short Wilson referred you) The first time I saw this newsletter, I was thinking "This is it?" as it came as a single e-mail. However, as I read through it, I realized what a great resource it is. This newsletter often provides ones that are open to a very select group of people. I learned about a sweepstakes last year that was only open to people born on the same day I was. I didn't win, but not because of persistence. It was one that could be entered every 24 hours, and I set my phone's alarm to go off at 24 hours so I would remember to enter it and not miss a day. There was a family emergency this summer, and I entered that one with my phone in a half dozen different states! I also very much use Google Alerts. There are certain things I am interested in winning, especially with a wedding coming up. In a couple months, I'll delete the ones I have to win things for my wedding. You can also set up alerts to find giveaways just on blogs. I have won a number of sweepstakes, contests, and blog giveaways where I have found them on google alerts an not through a sweepstakes site. When you win, remember to be nice to the sponsor. If you're on a trip win where you interact with sponsors, don't get together with a group who enter regularly and discuss other wins. If you win tickets to a ball game where the sponsors will see you, don't wear a t-shirt advertising a competitor's product. Thank you notes are a nice gesture, even if sent over e-mail. I recently won an Amazon Giveaway and tweeted a thank you to the sponsor. They answered back, and said I was the first of their many winners they had heard from. Posting a photo on a Facebook page or Instagram and tagging the sponsor is also a great way to say thank you. Sometimes those of us who enter have a bad reputation because sponsors think we just want things free. But we are also people who buy products. I actually switched brands of bread because they have so many giveaways. I figure why not support a company who gives so much stuff away? I've tried new products because of winning. I won some Laughing Cow cheese about ten years ago and have bought it regularly since then. Their $50 prize certainly got them a loyal customer! I can many times tell you who sponsored giveaways. They do it for advertising, and it works! If you want to read more about what the life of a contester was like in the 1950s, I recommend Prize Winner of Defiance Ohio. I like this book because it shows you have to have persistence and what can happen if you don't quit. It also is a good read for me because I like to think outside the box, and it helps be creative when I'm working on a big skill contest. I have read it about a dozen times since it was published and I credit it to helping my creative juices to flow and winning a trip to Europe over ten years ago. One last thing, don't forget you are required to pay taxes on your winnings if you live in the USA. If you have any more questions, leave a comment and I'll try to respond.